EVANS, JAMES, teacher, Methodist minister and missionary, linguist, and author; b. 18 Jan. 1801 in Kingston upon Hull, England, son of James Evans, ship’s captain, and Mary —; m. 1822 Mary Blithe Smith, and they had two daughters, one of whom died in childhood; d. 23 Nov. 1846 in Keelby, England. In August 1830, while still at Rice Lake, Evans was accepted as a probationer in the Methodist Episcopal (later the Wesleyan Methodist) Church; between 1831 and 1833 he served on the Credit, Ancaster, and St Catharines circuits. 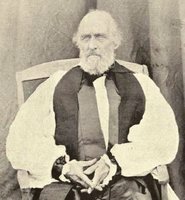 Ordained in 1833, he was appointed to the St Clair Mission (near Port Sarnia) the following year. When he arrived in July he found many Ojibwas opposed to Christianity [see Bauzhi-geezhig-waeshikum]; in March 1835 he reported 15 converts. His work there and the encouragement he received from other Methodist missionaries provided the basis for his rapid progress in native linguistics. A committee composed of Joseph Stinson*, Peter Jones*, Case, Evans, and his brother Ephraim* was appointed by the Canada Conference of the Methodist Church to prepare an orthographic system for the Ojibwa language. 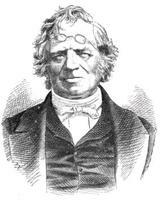 By 1836 James Evans had devised an Ojibwa syllabary of eight consonants and four vowels, but it was not accepted that year for printing by the bible society in Toronto. He spent four months in New York in 1837 securing the printing of translated hymns and Scripture and of his Speller and interpreter, in Indian and English, for the use of the mission schools. 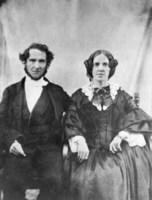 The following year Evans and Thomas Hurlburt*, a fellow missionary and linguist, were sent by the Canada Conference to undertake a tour of the north shore of Lake Superior. On 18 May 1839 Evans met George Simpson*, the governor of the Hudson’s Bay Company, and evidently satisfied him that Methodist missionaries would not disrupt company activities in the northwest. Simpson consequently assured him that the HBC territory was open to the Methodists. 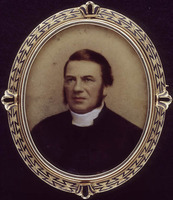 Upon returning to Upper Canada that summer, Evans was appointed minister at Guelph. In January 1840 Simpson, who wished to restrict the activity of Anglican and Roman Catholic missionaries to the Red River country (Man. ), announced an agreement whereby three missionaries named by the Wesleyan Methodist Missionary Society in Britain were to be placed at strategic points in the northwest. Probably at the insistence of the British Wesleyans, a superintendent’s position was later added and on 7 April Evans learned of his appointment. The party increased from four to eight as a result of the inclusion of Evans’s wife and daughter and native assistants Peter Jacobs [Pahtahsega*] and Henry Bird Steinhauer*. Evans arrived at Norway House (Man.) in August and by October all of the other missionaries were in place and working: George Barnley at Moose Factory (Ont. ), William Mason at Rainy Lake, and Robert Terrill Rundle* at Fort Edmonton (Edmonton, Alta). Now at the peak of his career, Evans found his mission work at Norway House and in the nearby Indian village of Rossville both satisfying and demanding. His development of the Ojibwa syllabary enabled him within two months of his arrival to prepare the basic structure of a syllabary for another Algonkian language (Cree), to begin using the new syllabic alphabet in his schools and religious services, and to initiate a program of translating and printing. Seven works, all printed in syllabics (using crude type cast by Evans, apparently from the lead linings of tea-chests), are recorded for the Rossville Mission Press during his superintendence. However, his fervour, his concerns for the native peoples, and his location at a main transfer point of the HBC led him to criticize company policy and practice, including labour on the Sabbath. The company had its own grievances, including the cost of the missionaries’ freight, Evans’s ban on Sunday travel by converted Indians, and his independent conduct. 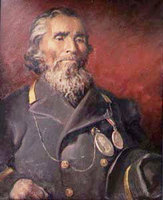 In December 1842 Simpson instructed Chief Factor Donald Ross at Norway House not to allow Evans’s presence at the company’s Council. The next year Simpson had the Evans family moved from the fort to Rossville, to reduce the missionary’s interference in company affairs and to lessen social rivalry in the small confines of the fort, particularly between the wives of Evans and Ross. By 1845 the trading monopoly of the HBC was being sorely tested by free traders [see Pierre-Guillaume Sayer]. That year, in a letter to Simpson, Evans defended the right of natives to exchange furs – a practice they described as gift-giving but which the HBC considered a form of trading that infringed on its monopoly – and requested authorization for them to give a fur to the mission. The governor wrote immediately, in June, to Robert Alder* of the WMMS requesting his removal from HBC territory. A response would not come until a year later. In the mean time troubles from other directions created stress for Evans and heightened controversy. In 1844, while he was on a canoe trip to the Athabasca country to counter the efforts of the Roman Catholic missionary Jean-Baptiste Thibault*, a gun held by Evans had accidentally discharged, killing Thomas Hassall, his most trusted teacher and interpreter Evans never recovered from the shock. Reports of his changed character and emotional disturbance began to appear in company correspondence. At Rossville his small house was crowded, a result of his taking in several native girls, and he was lonely for his daughter, Eugenia Clarissa, after her marriage to John McLean* on 18 Aug. 1845. By this time disputes with the HBC over free trade and travelling on the Sabbath had flared into open hostility. In June Simpson withdrew the company’s provision of food for the mission’s households and authorized instead an annual grant of £200 to cover “all expenses.” Under the increasing stress, threats to Evans’s health – kidney infections and heart problems – now became grievous. In February 1846 rumours of sexual play with the native girls in his home became formal charges against Evans by the Indians of the Rossville community. Evans instructed William Mason to conduct a church trial under Wesleyan discipline to test the accusations. Though he was found not guilty, his caring for a sick girl in his house was judged imprudent. The issue seemed settled, but he keenly resented the judgement of imprudence and Mason’s forwarding of the documents from the trial to the missionary society in London. Additional submissions and charges were sent separately to London by Governor Simpson. Alder’s letter arrived in June, bringing a response to Simpson’s request for the removal of Evans. Without revealing the request, Alder invited Evans to England for talks and suggested that he return eventually to the St Clair Mission. Upon arriving in London in October, Evans was examined by the society’s secretaries, Alder and John Beecham. They also found him innocent of sexual misconduct but stated that his treating the native girls in his home with the same familiarity as he treated his daughter had been unseemly and improper. Evans died suddenly of a heart attack following a missionary rally in Lincolnshire in November. After his departure from the northwest, the Wesleyan missions there declined and for some time no effort was made to revive them. The agonizing circumstances of Evans’s last year do not diminish the worth of his many achievements, most notably the invention and introduction of syllabic characters for the Cree language. This easily learned form of written Cree spread rapidly among the native communities, initially as a result of the translating and printing done at Rossville by Evans, William and Sophia* Mason, Steinhauer, John Sinclair, and others. Evans’s syllabary was soon adopted and adapted by rival missionary groups, the Church Missionary Society [see James Hunter*; John Horden*] and the Oblates of Mary Immaculate. Their extensive work in translation and publication ensured the survival and spread of the syllabic system; that it remains in use today is strong testimony to Evans’s accomplishment. 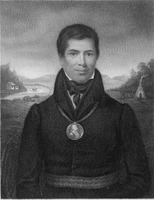 James Evans is the author of The speller and interpreter, in Indian and English, for the use of the mission schools, and such as may desire to obtain a knowledge of the Ojibway tongue (New York, 1837). 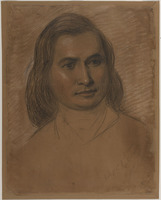 He was involved in producing Ojibwa versions of a number of Methodist publications, including The first nine chapters of the first book of Moses, called Genesis, translated by Evans and revised and corrected by Peter Jones (York [Toronto], 1833), a hymn-book which appeared under the Ojibwa title Nu-gu-mo-nun Ojeboa . . . , translated by Evans and George Henry (New York, 1837), and several other works listed in J. C. Pilling, Bibliography of the Algonquian languages (Washington, 1891), reprinted as J. C. Pilling, Bibliographies of the languages of North American Indians (9 parts in 3 vols., New York, 1973), vol.2. The Cree translations which Evans subsequently prepared and printed at the Rossville Mission Press are listed and discussed in the studies by Peel and Nichols cited below. Portions of his correspondence have been edited by Fred Landon and printed as “Selections from the papers of James Evans, missionary to the Indians” and “Letters of Rev. James Evans, Methodist missionary, written during his journey to and residence in the Lake Superior region, 1838–39,” OH, 26 (1930): 474–91 and 28 (1932): 47–70. The Ojibwa syllabary which he had developed by 1836 is found in the James Evans coll. at Victoria Univ. Library in Toronto (where it is incorrectly identified as his later Cree syllabary), and in the James Evans papers in the Regional Coll. at UWOL. A portrait of Evans, by John Wycliffe Lowes Forster*, is at the UCC-C.
Humberside Record Office (Beverley, Eng. ), Reg. of baptisms for the parish of Sculcoates (Kingston upon Hull), 19 Feb. 1801. PABC, Add. mss 635, box 3, folder 78, Simpson to Ross, 1, 3 Dec. 1842; folder 79; box 5, folder 176, esp. Ross to Simpson, 15 Aug. 1842. PAM, HBCA, A.12/2; B.235/c/1, no.5; D.4/25: ff.47–47d, 62d; D.4/62: ff.67d–68; D.4/68: ff.54–55d, 154d–155; D.5/8, 11–12, 14, 17–18. SOAS, Methodist Missionary Soc. Arch., Wesleyan Methodist Missionary Soc., corr., North America, Hudson’s Bay territories, boxes 13, 101–5. UCC-C, John MacLean papers, doc.E99, c88m, William Mason, 30 Dec. 1886. R. M. Ballantyne, Hudson’s Bay; every day life in the wilds of North America, during six years’ residence in the territories of the Honourable Hudson’s Bay Company (2nd ed., Edinburgh and London, 1848). Letitia [Mactavish] Hargrave, The letters of Letitia Hargrave, ed. Margaret Arnett MacLeod (Toronto, 1947). R. T. Rundle, The Rundle journals, 1840–1848, intro. and notes G. M. Hutchinson, ed. H. A. Dempsey (Calgary, 1977). Wesleyan Methodist Church, Missionary Soc., Missionary Notices (London), new ser., 2 (1844): 413. Wesleyan Methodist Church in Canada, The minutes of twelve annual conferences . . . from 1846 to 1857 . . . (Toronto, 1863). Christian Guardian, 9 Jan., 17 April, 10 May 1839; 1 April 1840. G. H. Cornish, Cyclopædia of Methodism in Canada, containing historical, educational, and statistical information . . . (2v., Toronto and Halifax, 1881–1903), 1. Death notices of Ont. (Reid). Boon, Anglican Church. J. W. Grant, Moon of winter time: missionaries and the Indians of Canada in encounter since 1534 (Toronto, 1984). John McLean, James Evans: inventor of the syllabic system of the Cree language (Toronto, 1890). J. D. Nichols, “The composition sequence of the first Cree hymnal,” Essays in Algonquian bibliography in honour of V. M. Dechene, ed. H. C. Wolfart (Winnipeg, 1984), 1–21. B. [B.] Peel, Rossville Mission Press: the invention of the Cree syllabic characters, and the first printing in Rupert’s Land (Montreal, 1974). J. E. Sanderson, The first century of Methodism in Canada (2v., Toronto, 1908–10). Nan Shipley, The James Evans story (Toronto, 1966). E. R. Young, The apostle of the north, Rev. James Evans (Toronto, 1900). T. C. B. Boon, “The use of catechisms and syllabics by the early missionaries of Rupert’s Land,” UCC, Committee on Arch., Bull. (Toronto), no.13 (1960): 8–17. Nathanael Burwash, “The gift to a nation of a written language,” RSC Trans., 3rd ser., 5 (1911), sect.ii: 3–21. J. [S.] Carroll, “James Evans, the planter of Methodist missions in Rupert’s Land,” Canadian Methodist Magazine (Toronto and Halifax), 16 (January–June 1883): 329–40. G. M. Hutchinson, “James Evans’ last year,” Canadian Church Hist. Soc., Journal (Sudbury, Ont. ), 19 (1977)/UCC, Committee on Arch., Bull., no.26 (1977): 42–56. E. R. Young, “James Evans, the inventor of the syllabic characters,” Canadian Methodist Magazine, 16: 433–48. Gerald M. Hutchinson, “EVANS, JAMES,” in Dictionary of Canadian Biography, vol. 7, University of Toronto/Université Laval, 2003–, accessed April 22, 2019, http://www.biographi.ca/en/bio/evans_james_7E.html.